In a way, we all long for freedom. Freedom from some form of restriction, some sort of pressure, mandate or expectation that we believe is holding us back. The desire to break ourselves free from these restrictions, allowing ourselves to reach our true potential, or obtain a new level of self-awareness is ingrained in our culture. Tales of striving for greater freedom can be found peppered throughout our literature, movies and music. It is the underlying theme of the story of this nation, from overthrowing monarchy to westward expansion, ending slavery, and later the open road. One could even view the baby boomer obsession with large suburban homes and the millennial obsession with authenticity and acceptance of individual preferences as simply the most recent chapters of a freedom themed cultural progression. Cars have always been symbolic of freedom. The mass production of automobiles in the early 20th Century made it possible for the average person to travel over large distances at the time of their own choosing. Those who purchased an automobile were no longer subject to train schedules when making trips both short and long. “The Open Road” meant people now have the freedom to go when they want to go, where they want to go, and change their mind whenever they’d like. At the High Plains Raceway, this freedom is celebrated, and, well cranked up a notch. Here, in a world where access to automobiles is now nearly universal, drivers free themselves of the few restrictions that remain. For most, this primarily refers to the speed limit. Here, for all practical purposes, there are no rules (in reality, there are a few for safety purposes, but they mainly revolve around how to conduct oneself in the event of an incident like a crash or a gasoline spill). There is just how fast one can take the turns that make up the race course. The feeling of having one of these inhibiting restrictions lifted, whether permanent or temporary, is hard to describe. It’s joyous, almost in a jubilant manner. It’s reassuring, anxious, and exhilarating at the same time. I often equate it to a cyclist suddenly no longer having their brakes unnecessarily engaged while trying to pedal, or a runner no longer having 10 pound weights tied around their ankles. Everything just suddenly feels like it is moving faster, and flowing more smoothly. But, there is some level of risk one takes by coming to a facility like this. Upon entry, every person, even guests who do not intend to drive a vehicle at all, must sign waivers, accepting the risks they take. This includes understanding that there are dangers, both to life and property. Crashes at high speeds can do damage to one’s life and limb in situations like these. And, some of the vehicles at this raceway are valued at upwards of half a million dollars, assets that could be permanently lost when accidents render the vehicles irreparable (I am told that standard automobile insurance does not apply while on race tracks like this). For these reasons, many will probably choose never to take part in this activity. This is the case with many activities of this nature, from something as major as starting a new business to something as minor as stealing two sips of vodka from one’s parent’s liquor cabinet at the age of 15. Some of us dive into the activity without thinking. Some of us will shy away, and avoid the risk. We all want freedom. But, we all also want security. Most of us also desire equality, justice, or some sense of “fairness”. Most of our sociological conflicts come about when these desires are pitted against one another. In this year’s presidential election, Americans have largely been denied a true discussion about what our priorities are, in this realm, and how they should be met. But, that does not mean that determining how to free ourselves from our limitations, and how to prioritize this desire with other desires is not part of our lives every day, manifesting in the decisions we make and interactions we have. This entry was posted in Colorado, culture, lifestyles, New Activities, racetracks, transportation and tagged auto racing, Colorado, Driving, freedom, High Plains, High Plains Raceway, humanity, open road, race cars, sociology on October 11, 2016 by Stephen Jaye. One Hundred Years ago, it was common for people to live most or all of their lives in one place. People’s ties would remain with one community throughout their lives. For a typical American one hundred years ago, this all but guaranteed that certain people would remain in each other’s lives throughout its course. All that changed as society became more mobile. While there are still some people out there that remain in their community or metropolitan area of origin throughout their lives, it has also become quite common for people to move to different regions as their lives progress. This makes each of life’s new chapters increasingly involve new places, new people, or both. In early 21st century society, even those that are committed to one place for life will experience significant flux with regards to the people they encounter and interact with on a day-to-day basis. As one’s life turns from one chapter to another, it is all too easy for anyone to lose touch with the people that had grown important to them in any of their lives’ previous chapters. Life’s new chapter demands attention, and it is a bad idea to constantly live in the past. It also suddenly requires significantly more effort to remain in touch with people, especially if the next chapter of your life involves a move to another city/region. However, I definitely believe it is worthwhile to keep in touch. Many people have told me that I am good at keeping in touch with people. I believe this only to be true for early 21st century standards. Overall, I still think I could do a much better job of this. One problem is that our society is still in a restructuring phase. We are restructuring our communities around increasing mobility, new forms of communication, and our society’s changing needs. We now have websites like Facebook that help us keep in touch. But, while Facebook helps us track each other’s lives from remote locations, it is no true substitute for having actual experiences with one another. This is why I decided to take some spare time I have to go on a major fall road trip. 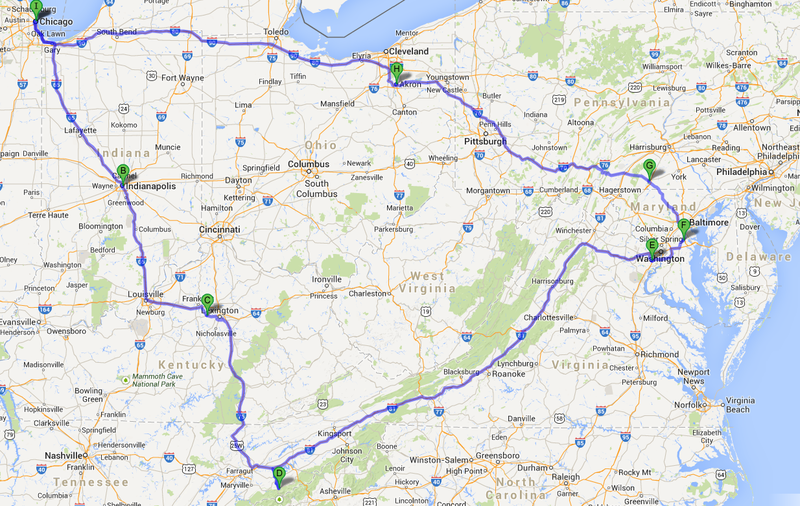 My itinerary is summarized above, but there will probably be more to it than what is presented on this map. My idea behind this trip is to see some people that have been, and still are, important to me, but also develop some new experiences. With a total of two weeks worth of time, I will not be able to make it to all of the places I would like to, and see all of the people I would like to. But, I still think I came up with a plan that will allow me to reconnect with a significant number of people with whom I would like to remain connected with, without being too hurried to actually enjoy the experiences. I have a plan, but I am ready to adjust, and there is some extra time built in. It is a balanced road trip, a mix of the familiar and the new, a mix of the urban and the wilderness, and a blend of efficiency and flexibility. This entry was posted in sociology, trip preview and tagged keeping in touch, Road Trip, sociology, trip preview on October 21, 2013 by Stephen Jaye.